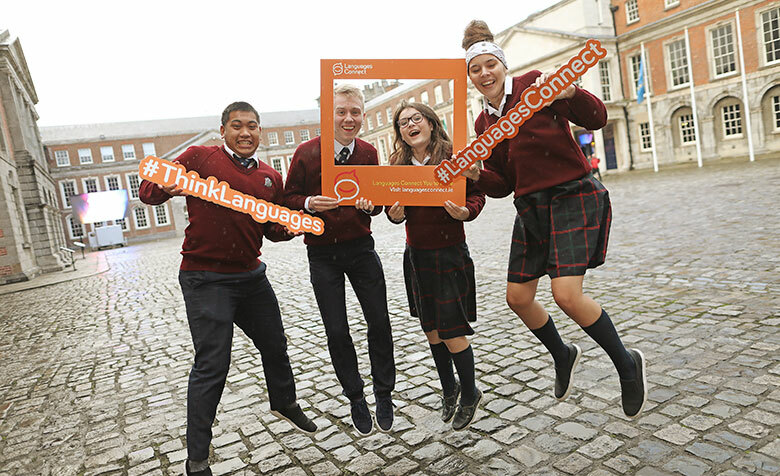 #ThinkLanguages, an event for TY students, was held in Dublin Castle on Tuesday 20th November. It was organised by the Post-Primary Languages Initiative as part of the Languages Connect campaign to raise awareness of the value of teaching and learning foreign languages. Students came from schools in Donegal, Longford, Louth, Meath, Offaly, Limerick, Westmeath, Wicklow, and Dublin. The aim of the day was to show students how useful languages are for a wide variety of careers, and to encourage them to choose a language as one of their Leaving Certificate subjects. The keynote speaker was James Hart, a Munster Rugby player, who has played for two French rugby clubs, Grenoble and the Parisian club Racing 92. Other inspirational speakers included Sgt McInerney from the Garda Diversity Unit and engineer Declan O’Loughlin, both of whom have careers that have benefitted from having great language skills. All participants experienced what it is like to be at an international conference and be dependent on an interpreter, using the interpreting facilities in Dublin Castle Conference Centre. 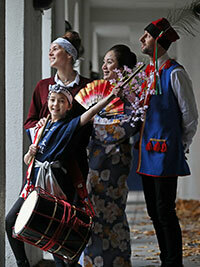 Other highlights included entertainment by a Taiko drum team facilitated by Nobuko Ijichi and a tasting session of international cuisine. There were quizzes on an app to facilitate engagement with videos which showcase the value of foreign languages for work, and which encourage students to get the most out of the day. The event also included an exhibition space, where students could speak to people about how to improve their languages, and discover how languages fit in with their dream job. The opportunity to experience two different taster workshops in foreign languages and cultural activities was a highlight. The workshops were facilitated by experts and included Irish Sign Language, Spanish and Salsa, Portuguese Capoeira, Italian, Polish and Russian language taster classes, Japanese origami, Japanese dance, Chinese calligraphy and Politics and Languages. The event ended with a visit from Minister Joe McHugh encouraging us all to learn languages and even impressing us with his own language skills!